Keep yourself up to date with beach fashion in Spain. 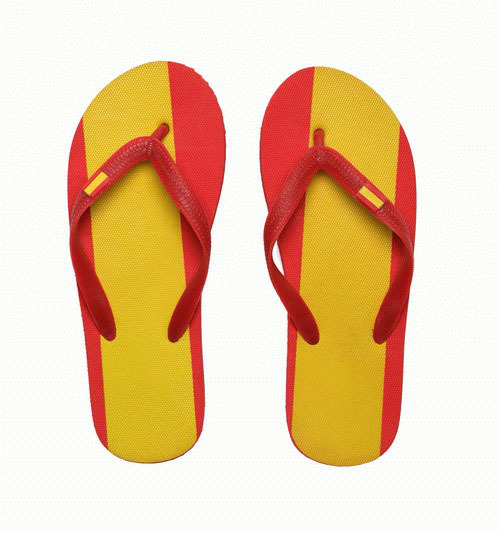 Slippers, sandals, flip flops with Spanish flag colours, a definitive bet on a very Spanish-like look. Rubber slippers with a flat sole, perfect for the beach. Comfort and exclusive design to be worn in summer or just to stay at home. When there is a hot weather coming our feet need fresh air. Being climate or pure aesthetics the reasons, this kind of footwear represents summer arrival. Created originally to go to the beach or swimming pool, these flip-flops have gone beyond in their basic use and have become ideal shoes to be worn in the city, too. Furthermore, in the same way,the soles were innovated, in spite of not being seen usually, now you can find them with original designs as flags or printing of a famous painting. The actual boom of a slipper has its true origins in Japan. All point at Japanese to be real inventors of flip flops, because in such countries as New Zealand flip flops are known as ''jandals''(from Japanese word: sandals). However, Australia has been an important promoter of this kind of footwear, converting flip flops a national icon. Australians call them ''thongs'' or ''pluggers'' though the word flip flop is also accepted. This product does not include the bag.